St. Louis /seɪnt ˈluːɪs/ is an independent city and a major United States port in eastern Missouri. The city reaches the western banks of the Mississippi River, which forms Missouri's eastern border with Illinois. At the 2010 census, St. Louis' population was 319,294 and a 2013 estimate put the population at 318,416, making it the 58th-most populous U.S. city in 2013 and the second largest city in the state. The St. Louis metropolitan area, known as Greater St. Louis (CSA), includes the city as well nearby areas in Missouri and Illinois and is among the 20 largest metropolitan areas in the United States with a population of 2,900,605. The city of St. Louis was founded in 1764 by Pierre Laclède and Auguste Chouteau, and named for Louis IX of France. After the Louisiana Purchase, it became a major port on the Mississippi River. In the late 19th century, St. Louis became the fourth-largest city in the United States. It seceded from St. Louis County in March 1877, allowing it to become an independent city and limiting its political boundaries. In 1904, it hosted the Louisiana Purchase Exposition and the 1904 Summer Olympics. The city's population peaked in 1950, then began a long decline that continues in the 21st century. Immigration has increased, and it is the center of the largest Bosnian population in the world outside their homeland. The economy of St. Louis relies on service, manufacturing, trade, transportation of goods, and tourism. The city is home to several major corporations, including Express Scripts, Peabody Energy, Ameren, Ralcorp and Sigma-Aldrich. St. Louis is home to three professional sports teams: the St. Louis Cardinals, one of the most successful Major League Baseball clubs, the St. Louis Blues of the National Hockey League, and the St. Louis Rams of the National Football League. The city is commonly identified with the Gateway Arch, which is part of the Jefferson National Expansion Memorial in downtown St. Louis. The area that would become St. Louis was a center of Native American Mississippian culture, which built numerous temple and residential earthwork mounds on both sides of the Mississippi River. Their major center was at Cahokia Mounds, active from 900 AD to 1500 AD. The major earthworks within St. Louis boundaries were the source of the city's early nickname, the "Mound City." Historic Native American tribes in the area included the Siouan-speaking Osage people and the Illiniwek. European exploration of the area was recorded in 1673, when French explorers Louis Jolliet and Jacques Marquette traveled through the Mississippi River valley. Five years later, La Salle claimed the region for France as part of La Louisiane. The earliest European settlements in the area were built in Illinois Country (also known as Upper Louisiana) during the 1690s and early 1700s at Cahokia, Kaskaskia, and Fort de Chartres. Migrants from the eastern French villages founded Ste. Genevieve, Missouri, across the Mississippi River from Kaskaskia. In early 1764, after France lost to the British in North America, Pierre Laclède and his stepson Auguste Chouteau founded the city of St. Louis. The early French families built the city's economy on the fur trade with the Osage, as well as with more distant tribes along the Missouri River. They used African slaves as domestic servants and workers in the city. From 1764 to 1803 European control of the area west of the Mississippi to the northernmost part of the Missouri River basin, called Louisiana, was assumed by the Spanish as part of the Viceroyalty of New Spain. In 1780 during the American Revolutionary War, St. Louis was attacked by British forces, mostly Native American allies, in the Battle of St. Louis. St. Louis was transferred to the Republic of France in 1800, then sold to the United States in 1803 as part of the Louisiana Purchase. The city became the territorial capital and gateway to the western territory. Shortly after the purchase, the Lewis and Clark Expedition left St. Louis in May 1804 to explore the vast territory, reaching the Pacific Ocean in summer 1805, and returning on September 23, 1806. Both Lewis and Clark lived in St. Louis after the expedition. Many other explorers, settlers, and trappers (such as Ashley's Hundred) would later take a similar route to the West. The city elected its first municipal legislators (called trustees) in 1808. Steamboats first arrived in St. Louis in 1818, improving connections with New Orleans and eastern markets. Missouri was admitted as a state in 1821, in which slavery was legal. The capital was moved from St. Louis to a more central location. St. Louis was incorporated as a city in 1822, and continued to see growth due to its port connections. Slaves worked in many jobs on the waterfront as well as on the riverboats. Given the city's location close to the free state of Illinois and others, some slaves escaped to freedom. Others, especially women with children, sued in court in freedom suits, and several prominent local attorneys aided slaves in these suits. Immigrants from Ireland and Germany arrived in St. Louis in significant numbers starting in the 1840s, and the population of St. Louis grew from less than 20,000 in 1840, to 77,860 in 1850, to more than 160,000 by 1860. By the mid-1800s, St. Louis had a greater population than New Orleans. To this day, St. Louis is the largest city of the former French Louisiana territory. An illustrated map by F. Graf; Saint Louis in 1896. Settled by many Southerners in a slave state, the city was split in political sympathies and became polarized during the American Civil War; in 1861, 28 civilians were killed in a clash with Union troops. The war hurt St. Louis economically, due to the Union blockade of river traffic to the South. The St. Louis Arsenal constructed ironclads for the Union. After the war, St. Louis profited via trade with the West, aided by the 1874 completion of the Eads Bridge, the first bridge so far downriver over the Mississippi. Industrial developments on both banks of the river were linked by the bridge. On August 22, 1876, the city of St. Louis voted to secede from St. Louis County and become an independent city. Industrial production continued to increase during the late 19th century. Major corporations such as the Anheuser-Busch brewery and Ralston-Purina company were established. St. Louis also was home to Desloge Consolidated Lead Company and several brass era automobile companies, including the Success Automobile Manufacturing Company; St. Louis is the site of the Wainwright Building, an early skyscraper built by noted architect Louis Sullivan in 1892. In 1904, the city hosted the 1904 World's Fair and the 1904 Summer Olympics, becoming the first non-European city to host the Olympics. Permanent facilities and structures remaining from the fair are Forest Park, the St. Louis Art Museum, the St. Louis Zoo and the Missouri History Museum. In the aftermath of emancipation of slaves following the Civil War, social and racial discrimination in housing and employment were common in St. Louis. Starting in the 1910s, many property deeds included racial or religious restrictive covenants. During World War II, the NAACP campaigned to integrate war factories, and restrictive covenants were prohibited in 1948 by the Shelley v. Kraemer U.S. Supreme Court decision, which case originated as a lawsuit in St. Louis. However, de jure educational segregation continued into the 1950s, and de facto segregation continued into the 1970s, leading to a court challenge and interdistrict desegregation agreement. St. Louis, like many Midwestern cities, expanded in the early 20th century due to the formation of many industrial companies, providing employment to new generations of immigrants. It reached its peak population of 856,796 at the 1950 census. Suburbanization from the 1950s through the 1990s dramatically reduced the city's population, and this was exacerbated by the relatively small geographical size of St. Louis due to its earlier decision to become an independent city. During the 19th and 20th century, most major cities aggressively annexed surrounding areas as they grew out away from the central city, however St. Louis was unable to do so. The city of St. Louis contains only 11% of its total metropolitan population, while the central city averages 24% of total metropolitan area population among the top 20 metro areas in the United States. Although small increases in population were seen in St. Louis' population during the early 2000s, the city of St. Louis lost population from 2000 to 2010. Immigration has continued, with the city attracting Vietnamese, Latinos from Mexico and Central America, and Bosnians, the latter forming the largest Bosnian community outside their homeland. Several urban renewal projects were built in the 1950s, as the city struggled to improve old and substandard housing. Some of these were poorly designed and resulted in problems, of which Pruitt-Igoe became a symbol of failure and was torn down. Since the 1980s, revitalization efforts have focused on downtown St. Louis, and gentrification has taken place in the Washington Avenue Historic District. Because of its strategic efforts and the upturn in urban revitalization, St. Louis received the World Leadership Award for urban renewal in 2006. According to the United States Census Bureau, St. Louis has a total area of 66.2 square miles (171 km2), of which 61.9 square miles (160 km2) is land and 4.2 square miles (11 km2) or 6.39%) is water. (Not shown on simple maps of the city, the land at its airport is owned by the city, served by its fire department and others and is an exclave of St. Louis.) The city is built primarily on bluffs and terraces that rise 100–200 feet above the western banks of the Mississippi River, in the Midwestern United States just south of the Missouri-Mississippi confluence. Much of the area is a fertile and gently rolling prairie that features low hills and broad, shallow valleys. Both the Mississippi River and the Missouri River have cut large valleys with wide flood plains. The city's eastern line is the Mississippi River, which also separates Missouri from Illinois. The Missouri River forms the northern line of St. Louis County, except for a few areas where the river has changed its course. 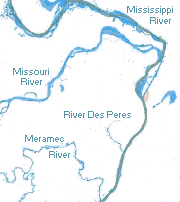 The Meramec River forms most of its southern line. Spring (March through May), is typically the wettest season, with 11.7 in (297 mm) of precipitation, although dry spells lasting one to two weeks are possible during the growing seasons. Spring produces severe weather ranging from tornadoes to winter storms. St. Louis has thunderstorms 48 days a year on average. Especially in the spring, these storms can often be severe, with high winds, large hail and tornadoes. Lying near the hotbed of the Tornado Alley, St. Louis is one of the metropolitan areas with most frequent tornadoes. The area has an extensive history of damaging tornadoes. Summers are hot and humid; temperatures of 90 °F (32 °C) or higher occur 43 days a year. The daily average temperature in July is 80.0 °F (26.7 °C). The record high temperature is 115 °F (46 °C) on July 14, 1954. July 2012 was the hottest month in the 138-year recorded weather temperatures in St. Louis history starting in 1874, with an average daily temperature of 88.1 °F (31.2 °C). The 25th of that month also tied the all-time record warm daily minimum of 86 °F (30 °C), first set July 24, 1901. Fall is mild and sunny, with lower humidity and can produce intermittent bouts of heavy rainfall, with the first measurable snow usually falling around December 4. Peak fall foliage occurs in mid-to-late October. Some late autumns feature a period of warm weather known as Indian summer; some years see roses in bloom as late as early December. Winters can be brisk, as high temperatures below freezing occur 25 days per year, on average. Each winter regularly has at least one major snowstorm accumulating 4 inches or more. The season can also bring comparable amounts of rain; nonetheless, it is typically the driest season. Winter storm systems, such as Alberta clippers and Panhandle hooks, can yield heavy freezing rain, ice pellets, and snowfall, typically followed by a few days of clear but very cold weather. The daily average temperature in January is 31.8 °F (−0.1 °C). The official record low is −22 °F (−30 °C) on January 5, 1884, although there were unofficial readings of −23 °F (−31 °C) on January 29, 1873; the record cold daily maximum is −5 °F (−21 °C) on Christmas Eve 1983. The average amount of winter precipitation is 7.5 in (191 mm). The average seasonal snowfall is 17.7 inches (45 cm), historically ranging from 1.5 in (3.8 cm) in 1953−54 to 67.6 in (172 cm) in 1911−12. Most of the residential areas of the city are planted with large native shade trees. The largest native forest area is found in Forest Park. In autumn, the changing color of the trees is notable. Most species here are typical of the eastern woodland, although numerous decorative non-native species are found; the most notable invasive species is Japanese honeysuckle, which is actively removed from some parks. Winter populations of Bald Eagles are found by the Mississippi River around the Chain of Rocks Bridge. The city is on the Mississippi Flyway, used by migrating birds, and has a large variety of small bird species, common to the eastern US. The Eurasian Tree Sparrow, an introduced species, is limited in North America to the counties surrounding St. Louis. The city has special sites for birdwatching of migratory species, including Tower Grove Park. Frogs are commonly found in the springtime, especially after extensive wet periods. Common species include the American toad and species of chorus frogs commonly called spring peepers, which are found in nearly every pond. Some years have outbreaks of cicadas or ladybugs. Mosquitos, no-see-ums, and houseflies are common insect nuisances, especially in July and August; because of this, windows are nearly universally fitted with screens, and screened-in porches are common in the older homes constructed before air-conditioning was common. Invasive populations of honeybees have sharply declined in recent years. Numerous native species of pollinator insects have recovered to fill their ecological niche. Due to a warming climate, Armadillos have been regularly seen throughout the St. Louis area, especially since 2005. St. Louis grew slowly until the American Civil War, when industrialization and immigration sparked a boom. After years of immigration and expansion, it reached its peak population in 1950. That year, the Census Bureau reported St. Louis' population as 82% White and 17.9% African American. After World War II, St. Louis began losing population to the suburbs, first because of increased demand for new housing, the ease of commuting by subsidized highways, and later, white flight. St. Louis has lost 62.7% of its population since the 1950 United States Census, the highest percent of any city that had a population of 100,000 or more at the time of the 1950 Census. Detroit and Youngstown, Ohio are the only other cities to have seen population declines of at least 60% in the same time frame. The African-American population is mostly centered in the north side of the city (the area north of Delmar Boulevard is 94.0% black, compared with 35.0% in the central corridor and 26.0% in the south side of St. Louis ). Among the Asian-American population in the city, the largest ethnic group is Vietnamese (0.9%), followed by Chinese (0.6%) and Asian Indians (0.5%). The Vietnamese community is most prevalent in the Dutchtown neighborhood; Chinese are concentrated in the Central West End. People of Mexican descent are the largest Latino group, and make up 2.2% of St. Louis' population. They have the highest concentration in the Dutchtown, Benton Park West (Cherokee Street), and Gravois Park neighborhoods. An estimated 70,000 Bosnians live in the metro area, the largest population outside their homeland. St. Louis is home to the only Bosnian-language newspaper in the U.S. In 2010, St. Louis' per-capita rate of online charitable donations and volunteerism were among the highest among major U.S. cities. As of 2013, the St. Louis area is home to nine Fortune 500 companies: Express Scripts, Emerson Electric, Monsanto, Reinsurance Group of America, Centene, Peabody Energy, Ameren, Graybar Electric, and Edward Jones Investments. Other notable corporations from the area include MasterCard, Citigroup, Microsoft, Bank of America, TD Ameritrade, BMO Harris Bank, Arch Coal, Cassidy Turley, AT&T Communications, Scottrade, Wells Fargo Advisors (formerly A.G. Edwards), Energizer Holdings, Heritage Home Group, Kerry Group, Patriot Coal, Post Holdings, Inc., United Van Lines and Mayflower Transit, Ralcorp, Hardee's, and Enterprise Holdings (parent company of several car rental companies). Health care and biotechnology institutions with operations in St. Louis include Pfizer, the Donald Danforth Plant Science Center, the Solae Company, Sigma-Aldrich, and Multidata Systems International. General Motors manufactures automobiles in the area, although Chrysler closed its production facility in nearby Fenton, Missouri. Several once-independent pillars of the local economy have been purchased by other corporations. Among them are Anheuser-Busch, purchased by Belgium-based InBev; Missouri Pacific Railroad, which was headquartered in St. Louis, merged with Omaha, Nebraska-based Union Pacific Railroad in 1982; McDonnell Douglas, whose operations are now part of Boeing Defense, Space & Security; Mallinckrodt, purchased by Tyco International; and Ralston Purina, now a wholly owned subsidiary of Nestle. The May Department Stores Company (which owned Famous-Barr and Marshall Field's stores) was purchased by Federated Department Stores, which has its regional headquarters in the area. The Federal Reserve Bank of St. Louis in downtown is one of two federal reserve banks in Missouri. St. Louis is a center of medicine and biotechnology. The Washington University School of Medicine is affiliated with Barnes-Jewish Hospital, the fifth-largest hospital in the world. The two institutions operate the Alvin J. Siteman Cancer Center. The School of Medicine also is affiliated with St. Louis Children's Hospital, one of the country's top pediatric hospitals. Both hospitals are owned by BJC HealthCare. The school's Genome Sequencing Center played a major role in the Human Genome Project. St. Louis University Medical School is affiliated with Tenet Healthcare's St. Louis University Hospitals and SSM Health Care's Cardinal Glennon Children's Hospital. It also has a cancer center, vaccine research center, geriatric center, and a bioethics institute. Several different organizations operate hospitals in the area, including BJC HealthCare, SSM Health Care, Tenet and Mercy Healthcare. Boeing employs nearly 15,000 people in its north St. Louis campus, headquarters to its defense unit. In 2013, the company said it would move about 600 jobs from Seattle, where labor costs have risen, to a new IT center in St. Louis. Other companies, such as LaunchCode, see the city's potential to become the next major tech hub. View of the Arch from Laclede's Landing. Also unique to St. Louis is the Ted Drewes "Concrete," which is frozen custard blended with any combination of dozens of ingredients, served in a large yellow cup with a spoon and straw. The mixture is so thick that a spoon inserted into the custard does not fall if the cup is inverted. Ted Drewes owns and operates a pair of frozen custard shops in St. Louis, which have been highlighted in the national media on several occasions. In 2006, the Route 66 (Chippewa) location was featured on the Food Network show Feasting on Asphalt, hosted by Alton Brown. In 2010, it was recommended by Bobby Flay on the "Sweet Tooth" episode of The Best Thing I Ever Ate. In 2011, it was featured in a special "Route 66" episode of Man v. Food Nation, hosted by Adam Richman. The architecture of St. Louis exhibits a variety of commercial, residential, and monumental architecture. St. Louis is known for the Gateway Arch, the tallest monument constructed in the USA at 630 feet. The Arch pays homage to Thomas Jefferson and St. Louis' position as the gateway to the West. Architectural influences reflected in the area include French Colonial, German, early American, and modern architectural styles. Early in the 20th century (and during the years before and after the 1904 World's Fair), several churches moved to the Central West End neighborhood, near Forest Park and the fairgrounds. The neighborhood features the Holy Corners Historic District, which is a concentration of several historic religious structures, such as the First Church of Christ, Scientist (1904). Louis Sullivan designed Charlotte Dickson Wainwright's tomb on the north side of Bellefontaine Cemetery, surrounded by a collection of similar tombs for the great old St. Louis families, interesting for their late-Gilded Age artwork. Shortly after the Civil War, St. Louis rapidly increased its school system and hospital system. One of the earliest structures and the oldest extant hospital building in St. Louis is the St. Louis Insane Asylum (now the Metropolitan St. Louis Psychiatric Center). The asylum is built of brick in the Italianate style, complete with cast iron dome and cupola reminiscent of the Old Courthouse. As St. Louis expanded, the city hall was moved further west of downtown to its present location in 1904 (construction began in 1892). St. Louis City Hall, still in use, was designed by Harvey Ellis in the Renaissance Revival style. City Hall also is reminiscent of the famed Hôtel de Ville, Paris, France. Other significant civic buildings from the late 19th century and early 20th century include the U.S. Customhouse and Post Office by Alfred B. Mullett (1873) and the stately St. Louis Public Library by Cass Gilbert (1912). While the Old Post Office has been renovated, the St. Louis Public Library is slated for renovation as of 2010. In 1923 the city passed a $87 million bond issue for re-development of the Civic Plaza along the lines of the City Beautiful movement. This development resulted in some of St. Louis's major civic architecture: the Soldiers' Memorial, the Civil Courts Building, and Kiel Auditorium. Then into the 1940s and 1950s a certain sub-genre of St. Louis modernism emerged, with the locally important Harris Armstrong, and a series of daring modern civic landmarks like Gyo Obata's Planetarium, the geodesic-dome Climatron, and the main terminal building at Lambert-St. Louis International Airport. The Poplar Street Bridge, a 647-foot (197 m) long (197m) deck girder bridge, was built in 1967 and continues to carry three Interstates and one U.S. route. St. Louis also was the headquarters for postwar modernist bank designer Wenceslaus Sarmiento, whose major work in St. Louis is the Chancery Building (1965) on the grounds of the Cathedral Basilica of St. Louis. The culmination of St. Louis modern architecture is Eero Saarinen's magnificent stainless-steel gesture, the Gateway Arch, centerpiece of the 91-acre (368,000 m2) riverside Jefferson National Expansion Memorial. A panoramic view of the St. Louis skyline, dominated by the 630-foot (190 m) Gateway Arch. The St. Louis Cardinals are one of the most successful franchises in Major League Baseball, and have won 19 National League titles, which are the most pennants for the league franchise in one city, and 11 World Series titles, with the most recent in 2011. They play at Busch Stadium. The Gateway Grizzlies and the River City Rascals of the Frontier League (which is not affiliated with Major League Baseball) also play in the area. The St. Louis Rams, an American football team in the National Football League play at the Edward Jones Dome and have won three NFL championships, including one Super Bowl victory in 2000. The St. Louis Blues of the National Hockey League play at the Scottrade Center, and the region hosts NHRA drag racing and NASCAR events at the Gateway International Raceway in Madison, Illinois. Additionally, the city is home to the St. Louis Chess Club, which hosts the U.S Championships every year, and since September 2011, home to the World Chess Hall of Fame, with the city becoming a major national chess hub. At the collegiate level, St. Louis has hosted the Final Four of both the women's and men's college basketball NCAA Division I championship tournaments, and the Frozen Four collegiate ice hockey tournament. Although the area does not currently support a National Basketball Association team, it hosts an American Basketball Association team called the St. Louis Phoenix. St. Louis University has won 10 NCAA Men's Soccer Championships, and the city has hosted the College Cup several times. In addition to collegiate soccer, many St. Louisans have played for the United States men's national soccer team, and 20 St. Louisans have been elected into the National Soccer Hall of Fame. St. Louis also is the origin of the sport of corkball, a type of baseball in which there is no base running. The St. Louis TV market is the largest in the nation without a Division I college football team. Other notable parks in the city include the Missouri Botanical Garden, Tower Grove Park, Carondelet Park and Citygarden. The Missouri Botanical Garden, a private garden and botanical research facility, is a National Historic Landmark and one of the oldest botanical gardens in the United States. The Garden features 79 acres of horticultural displays from around the world. This includes a Japanese strolling garden, Henry Shaw's original 1850 estate home and a geodesic dome called the Climatron. Immediately south of the Missouri Botanical Garden is Tower Grove Park, a gift to the City by Henry Shaw. Citygarden is an urban sculpture park located in downtown St. Louis, with art from Fernand Léger, Aristide Maillol, Julian Opie, Tom Otterness, Niki de Saint Phalle, and Mark di Suvero. The park is divided into three sections, each of which represent a different theme: river bluffs; flood plains; and urban gardens. The park also has a restaurant – Joe's Chili Bowl. Another downtown sculpture park is the Serra Sculpture Park, with the 1982 Richard Serra sculpture Twain. The city of St. Louis has a mayor-council government with legislative authority vested in the Board of Aldermen of the City of St. Louis and with executive authority in the Mayor of St. Louis and six other separately elected officials. The Board of Aldermen is made up of 28 members (one elected from each of the city's wards) plus a board president who is elected city-wide. The 2014 fiscal year budget topped $1 billion for the first time, a 1.9% increase over the $985.2 million budget in 2013. 236,253 registered voters lived in the city in 2012, down from 239,247 in 2010, and 257,442 in 2008. Municipal elections in St. Louis are held in odd numbered years, with the primary elections in March and the general election in April. The mayor is elected in odd numbered years following the United States Presidential Election, as are the aldermen representing odd-numbered wards. The President of the Board of Aldermen and the aldermen from even-numbered wards are elected in the off-years. The Democratic Party has dominated St. Louis city politics for decades. The city has not had a Republican mayor since 1949 and the last time a Republican was elected to another city-wide office was in the 1970s. As of 2006, 27 of the city's 28 Aldermen are Democrats. Forty-five individuals have held the office of mayor of St. Louis, four of whom—William Carr Lane, John Fletcher Darby, John Wimer, and John How—served non-consecutive terms. The most terms served by a mayor was by Lane who served 8 full terms plus the unexpired term of Darby. The current mayor is Francis G. Slay, who took office April 17, 2001, and who won a fourth four-year term on March 5, 2013. As of April 27, 2013, he is the longest-serving mayor of St. Louis. The second-longest serving mayor was Henry Kiel, who took office April 15, 1913 and left office April 21, 1925, a total of 12 years and 9 days over three terms in office. Two others—Raymond Tucker, and Vincent C. Schoemehl—also served three terms as mayor, but served seven fewer days. The shortest serving mayor was Arthur Barret who died 11 days after taking office. , which also includes part of northern St. Louis County. A Republican has not represented a significant portion of St. Louis in the U.S. House since 1953. Since the mid-1990s, St. Louis index crime rates have declined, although rates of violent crime and property crime in the city of St. Louis remain higher than both the state and United States national averages. St. Louis also frequently is ranked among the "most dangerous" in the country by CQ Press, although these rankings are controversial and do not reflect the crime rate of Greater St. Louis. In 2012, St. Louis ranked at number 4 of the top 5 most dangerous cities in America comparing violent crime rates, behind Flint, Michigan, Detroit, and Oakland. St. Louis University High School is the oldest secondary educational institution in Missouri. The city is home to two national research universities, Washington University in St. Louis and St. Louis University, as classified under the Carnegie Classification of Institutions of Higher Education. Washington University School of Medicine in St. Louis has been ranked among the top 10 medical schools in the country by US News & World Report for as long as the list has been published, and as high as second, in 2003 and 2004. Greater St. Louis commands the 21st-largest media market in the United States, a position roughly unchanged for over a decade. All of the major U.S. television networks have affiliates in St. Louis, including KTVI 2 (Fox), KMOV 4 (CBS), KSDK 5 (NBC), KETC 9 (PBS), KPLR-TV 11 (CW), KDNL 30 (ABC), WRBU 46 (Ion), and WPXS 51 Daystar Television Network. Among the area's most popular radio stations are KMOX (AM sports and talk, notable as the longtime flagship station for St. Louis Cardinals broadcasts), KLOU (FM oldies), WIL-FM (FM country), WARH (FM adult hits), and KSLZ (FM Top 40 mainstream). St. Louis also supports public radio's KWMU, an NPR affiliate, and community radio's KDHX. All-sports stations, such as KFNS 590 AM "The Fan", WXOS "101.1 ESPN", and KSLG are also popular. The St. Louis Post-Dispatch is the region's major daily newspaper. Others in the region include the Suburban Journals, which serve parts of St. Louis County, while the primary alternative newspaper is the Riverfront Times. Three weeklies serve the African-American community: the St. Louis Argus, the St. Louis American, and the St. Louis Sentinel. St. Louis Magazine, a local monthly magazine, covers topics such as local history, cuisine, and lifestyles, while the weekly St. Louis Business Journal provides coverage of regional business news. St. Louis is also home to the nation's last remaining metropolitan journalism review, the Gateway Journalism Review, based at Webster University in the suburb of Webster Groves. Furthermore, St. Louis is served by an online newspaper, the St. Louis Beacon, which operates in partnership and shares facilities with KETC 9 TV. Major roadways include the north-south Memorial Drive, located on the western edge of the Jefferson National Expansion Memorial and parallel to Interstate 70, the north-south streets of Grand Boulevard and Jefferson Avenue, both of which run the length of the city, and Gravois Road, which runs from the southeastern portion of the city to downtown and formerly was signed as U.S. Route 66. An east-west roadway that connects the city with surrounding communities is Martin Luther King, Jr. Drive, which carries traffic from the western edge of the city to downtown. Lambert St. Louis International Airport, owned and operated by the City of St. Louis, is 11 miles northwest of downtown along highway I-70 between I-170 and I-270 in St. Louis County. It is the largest and busiest airport in the state. In 2011, the airport saw 255 daily departures to about 90 domestic and international locations and a total of nearly 13 million passengers. The airport serves as a focus city for Southwest Airlines and was a former hub for Trans World Airlines and former focus-city for American Airlines and AmericanConnection. Air cargo transportation is available at Lambert International and at other nearby regional airports, including MidAmerica St. Louis Airport, Spirit of St. Louis Airport, and St. Louis Downtown Airport. Inter-city rail passenger train service in the city is provided by Amtrak. All Amtrak trains serving St. Louis use the Gateway Multimodal Transportation Center downtown. Amtrak trains terminating in the city include the Lincoln Service to Chicago, Illinois and the Missouri River Runner to Kansas City, Missouri. St. Louis is an intermediate stop on the Texas Eagle route which provides long-distance passenger service between San Antonio, Texas, and Chicago, Illinois. St. Louis is the nation's third-largest freight rail hub, moving Missouri exports such as fertilizer, gravel, crushed stone, prepared foodstuffs, fats, oils, nonmetallic mineral products, grain, alcohol, tobacco products, automobiles, and automobile parts. Freight rail service in St. Louis is provided on tracks owned by Union Pacific Railroad, Norfolk Southern Railway, Foster Townsend Rail Logistics - formerly Manufacturers Railway (St. Louis), Terminal Railroad Association of St. Louis, and the BNSF Railway. The Terminal Railroad Association of St. Louis (reporting mark: TRRA) is a switching and terminal railroad jointly owned by all the major rail carriers in St. Louis. The company operates 30 diesel-electric locomotives to move railcars around the classification yards, deliver railcars to local industries, and ready trains for departure. The TRRA processes and dispatches a significant portion of railroad traffic moving through the city and owns and operates a network of rail bridges and tunnels including the MacArthur Bridge (St. Louis) and the Merchants Bridge. This infrastructure is also used by commuter rail and long-distance passenger trains serving St. Louis. Modern Union Pacific EMD SD70ACe locomotive 1982, painted in Missouri Pacific Railroad livery. Missouri Pacific was headquartered in St. Louis until 1982, when it merged with Omaha, Nebraska-based Union Pacific. ^ "St. Louis City, Missouri – Population Finder – American FactFinder". United States Geological Survey. October 24, 1980. http://geonames.usgs.gov/pls/gnispublic/f?p=106:3:3712217792123411::NO::P3_FID:765765. Retrieved December 23, 2008. ^ a b c "State & County QuickFacts". United States Census Bureau. http://quickfacts.census.gov/qfd/states/29/29510.html. Retrieved September 14, 2013. ^ "Physical Growth of the City of St. Louis". http://stlouis.missouri.org/heritage/History69/. Retrieved July 27, 2010. ^ a b c National Weather Service archives - St. Louis office, http://www.crh.noaa.gov/lsx/?n=cli_archive, accessed October 28, 2013. ^ a b c "Just like it felt, July was hottest month on record in St. Louis". St. Louis Post-Dispatch. August 2, 2012. http://www.stltoday.com/news/local/metro/just-like-it-felt-july-was-hottest-month-on-record/article_5462b7b2-ade8-5004-bdc4-d3e477242be2.html. ^ The Weather Channel - Travel Maps http://www.weather.com/maps/activity/fallfoliage/usnormalfallpeaks_large.html, accessed February 2, 2014. ^ Warmer weather attracting Armadillos, http://herald-review.com/news/local/armadillos-finding-st-louis-and-surrounding-area-nice-place-to/article_3b52d19c-433c-53f0-a823-3da7776924ab.html, accessed October 28, 2013. ^ "St. Louis (city), Missouri". State & County QuickFacts. U.S. Census Bureau. http://quickfacts.census.gov/qfd/states/29/2965000.html. ^ a b c d "Race and Hispanic Origin for Selected Cities and Other Places: Earliest Census to 1990". U.S. Census Bureau. http://www.census.gov/population/www/documentation/twps0076/twps0076.html. Retrieved April 21, 2012. ^ a b "Race and Hispanic or Latino Origin: 2010". United States Census. http://factfinder2.census.gov/faces/tableservices/jsf/pages/productview.xhtml?pid=DEC_10_SF1_QTP3&prodType=table. ^ "Interactive: Mapping the census". United States Census. http://www.washingtonpost.com/wp-srv/special/nation/census/2010/. ^ Gilsinan, Kathy. "Why Are There So Many Bosnians in St. Louis?". The Atlantic Cities. Atlantic Media Company. http://www.theatlanticcities.com/politics/2013/02/why-are-there-so-many-bosnians-st-louis/4668/. Retrieved 15 February 2013. ^ "St. Louis (city) County, Missouri". Modern Language Association. http://www.mla.org/cgi-shl/docstudio/docs.pl?map_data_results. Retrieved August 10, 2013. ^ "U.S. Cities With Bigger Economies Than Entire Countries". The Wall Street Journal. July 20, 2012. http://blogs.wsj.com/economics/2012/07/20/u-s-cities-with-bigger-economies-than-entire-countries/tab/interactive/. Retrieved 24 July 2012. ^ "Fortune 500 List". Fortune. 2013. http://money.cnn.com/magazines/fortune/fortune500/2013/full_list. ^ "St. Louis Health Care". RCGA St. Louis. http://www.stlrcga.org/x438.xml. Retrieved May 24, 2013. ^ "Siteman Cancer Center, About Us". Siteman Cancer Center. http://www.siteman.wustl.edu/about-us.aspx. Retrieved May 24, 2013. ^ "Ratings and Rankings". RCGA St. Louis. 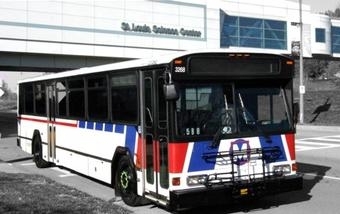 http://www.stlrcga.org/x2208.xml. Retrieved May 24, 2013. ^ Home - The Genome Institute at Washington University. Genome.wustl.edu. Retrieved on 2013-08-16. ^ "Boeing to shed 1,500 IT jobs here over next three years". The Seattle Times. May 10, 2013. http://seattletimes.com/html/businesstechnology/2020963458_boeingitxml.html. Retrieved May 13, 2013. ^ "Boeing's shift to St. Louis reflects broader shifts in local economy". St. Louis Post-Dispatch. May 13, 2013. http://www.stltoday.com/business/local/boeing-s-shift-to-st-louis-reflects-broader-shifts-in/article_bc7ea6d2-cf1b-5027-bc2f-ec3c578f6e08.html. ^ "The Largest Employers in St. Louis". St. Louis Business Journal. July 12, 2013. http://www.bizjournals.com/stlouis/blog/2013/07/the-largest-employers-in-st-louis.html. Retrieved August 31, 2013. ^ "Current Year Comprehensive Annual Financial Report (CAFR)". City of St. Louis (Comptroller's Office). January 10, 2014. http://www.stlouis-mo.gov/government/departments/comptroller/documents/Current-Year-Comprehensive-Annual-Financial-Report.cfm. Retrieved January 23, 2014. ^ "City of St. Louis CAFR (FY June 30, 2013)" (PDF). City of St. Louis. December 27, 2013. p. 201. https://www.stlouis-mo.gov/government/departments/comptroller/documents/loader.cfm?csModule=security/getfile&pageid=381132. Retrieved January 23, 2014. ^ "25 Things to Do in St. Louis". http://explorestlouis.com/visit-explore/discover/25-things-to-do-in-st-louis/. Retrieved February 17, 2012. ^ a b c d e f Saldivar, Marcos. "26 Reasons St. Louis Is America's Hidden Gem". Huffington Post. http://www.huffingtonpost.com/2014/03/21/st-louis-reasons-to-love_n_4993763.html. ^ David Bonetti, "Spectacular Citygarden is opening on schedule in St. Louis," St. Louis Post-Dispatch, June 28, 2009. ^ "City of St. Louis Elected Officials". Stlouis-mo.gov. July 8, 2010. http://stlouis-mo.gov/government/elected-officials.cfm. Retrieved March 24, 2012. ^ "City's budget tops $1 billion for first time". Business Journal. July 1, 2014. http://www.bizjournals.com/stlouis/morning_call/2014/07/citys-budget-tops-1-billion-for-first-time.html. ^ "SoS, Missouri – Elections: Registered Voters in Missouri 2012". Sos.mo.gov. http://www.sos.mo.gov/elections/registeredvoters.asp?rvmID=0012. Retrieved November 10, 2012. ^ "SoS, Missouri – Elections: Registered Voters in Missouri 2008". Sos.mo.gov. http://www.sos.mo.gov/elections/registeredvoters.asp?rvmID=0008. Retrieved April 1, 2012. ^ a b c "Missouri's New Congressional District Maps". Missouri Digital News. http://www.mdn.org/2012/DATA/MAPS/. Retrieved 14 January 2013. ^ St. Louis MO crime rates and statistics. NeighborhoodScout. Retrieved on 2013-07-21. ^ "The most dangerous cities in America, 2013". homes.yahoo.com. June 18, 2013. http://homes.yahoo.com/news/the-most-dangerous-cities-in-america--2013-201732579.html. ^ Malone, Roy. "Gateway Journalism Review". Sjreview.org. http://www.sjreview.org/. Retrieved March 24, 2012. ^ "Metro - Inside MetroLink". Metro. http://www.metrostlouis.org/InsideMetro/QuickFacts/metrolink.asp. Retrieved October 29, 2008. ^ "St. Louis Airport Reopens, One Concourse Remains Closed". Travelpulse.com. April 25, 2011. http://www.travelpulse.com/st-louis-airport-reopens-one-concourse-remains-closed.html. Retrieved November 22, 2011. ^ "St. Louis Port Authority". Stlouis-mo.gov. April 16, 2013. https://stlouis-mo.gov/government/departments/sldc/slpa/. Retrieved February 7, 2014. ^ "TRRA History". Terminalrailroad.com. http://www.terminalrailroad.com/About/TRRAHistory.aspx. Retrieved February 7, 2014. ^ "TRRA Home". Terminalrailroad.com. http://www.terminalrailroad.com. Retrieved February 7, 2014. ^ "Norfolk Southern Intermodal". Nscorp.com. http://www.nscorp.com/nscintermodal/Intermodal/System_Info/Terminals/stlouis.html. Retrieved February 7, 2014. ^ "Stuttgart Städtepartnerschaften" (in German). Landeshauptstadt Stuttgart, Abteilung Außenbeziehungen. http://www.stuttgart.de/item/show/14673/1. Retrieved July 27, 2013. ^ "Kontakty partnerskie Miasta Szczecin" (in Polish). Urząd Miasta Szczecin. Archived from the original on August 18, 2012. http://web.archive.org/web/20120818001351/http://bip.um.szczecin.pl/umszczecinbip/chapter_11296.asp. Retrieved July 29, 2013. This page uses content from the English language Wikipedia. The original content was at St. Louis. The list of authors can be seen in the page history. As with this Familypedia wiki, the content of Wikipedia is available under the Creative Commons License.